JAINA Newsletter: 1200 Japanese Became Vegetarians, Jain Centers News, Tapovan NRI Shibir For Kids..
1200 Japanese citizens, who follow Jainism, became vegetarians in last 5 years. This is a proud moment for all the Jains as we are able to spread Bhagwan Mahavir's Vani and Jain principles throughout the world in a true sense. Read more about it below. Jain Center of Greater Phoenix is celebrating their 10th anniversary with Pratishtha Mahotsav. More details are given below. Jain Society of Metropolitan Washington DC celebrated Mahavir Janma Kalyanak 2018 in April. More details are given below. Tapovan NRI Shibir 2018 - for kids to be held from July 15th to 21st. Please encourage the kids around you to participate. Details are given below. Just as everybody keeps away from the burning fire, so do the evils remain away from an enlightened person. Q 1: What does Ashrava mean? Q 2: What does Samvar mean? 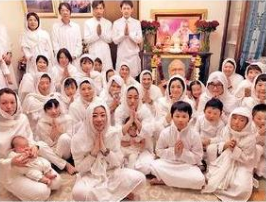 From the last few years, the practice of Jainism among Japanese citizens is growing. Jainism among Every year they come to Hastinapur, Palitana, and Shankheshwar to visit the Jain Tirths in India. According to the information, more than 1,200 Japanese people became vegetarian in the last 5 years. Recently, a large group ranging from an age group of 8 to 30 years came to Palitana from Japan and took part in the Parna and Diksha Mahotsav. They accepted the vows of Jainism with the accents of Navkar Mantra. It included the non-violence vow of adopting a vegetarian diet and stop eating meat for the rest of their life. Tulsi, an Indian-origin Japanese citizen, said that internal peace is experienced by travelling to Jain Tirths in India. Another Japanese woman mentioned that her whole family used to eat meat. But after she came in touch with people practicing Jain religion in Japan, they stopped eating meat. Now her two children wake up every morning and recite Navkar Mantra. The significance of knowing and understanding Jain religion, which is a synonym to science and spirituality, is growing in Japan. 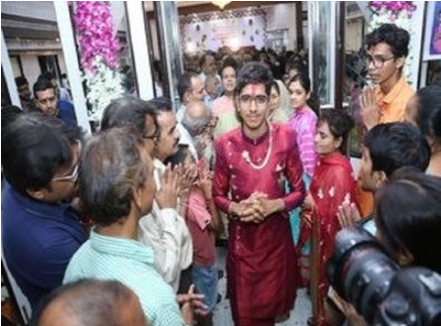 A 24-year-old Chartered Accountant, Mokshesh Sheth, renounced crores worth wealth and sought salvation by dedicating himself to the Jain community. He became a Jain monk at a ceremony held at Ahmedabad last week. His family, who owns JK Corporation, originally hails from Deesa in North Gujarat and is residing in Mumbai for over past 60 years. Mokshesh first thought of becoming a Jain monk at the age of 15 as he craved internal peace which the material world does not provide. However, his family convinced him to complete his education and experience the worldly pleasures first. . Finally, in January his family decides to allow him to become a monk. Jain Center of Greater Phoenix (JCGP) is celebrating 10th anniversary of the temple this year and they are cordially inviting you to its second phase of the Pratishtha event which is going to be held on 3rd and 4th July 2018. They are blessed to have the presence of Pujya Gurudev Shri Rakeshbhai Zaveri for the Pratishtha. Vidhikars from India will guide the Pratishtha event. Chirag Shah: +1 (602) 418-1497 / kcshah_us@yahoo.com. Visit www.jcgp.org for more info. More than 600 Jains attended the Mahavir Janma Kalyanak 2018 celebrations at Jain Society of Metropolitan Washington (JSMW) on April 14th, 2018. The program started with Navkar Mantra by the JSMW pathshala students from pre-nursery to class G and the teachers. A variety of beautiful dances, skits, dramas, garba raas, and enactments were performed about the life of Bhagwan Mahavir, his teachings and the struggle in our daily lives between ‘paap and punya’ and ‘good vs. evil’. A proclamation was presented to JSMW by Ms. Christina Poy, Director of Governor's Commission on Asian Pacific American Affairs, on behalf of the Governor of Maryland in recognition of Mahavir Janma Kalyanak. The cultural program was followed by Swami Vatsalya Bhojan. The MJK celebration was also in a way a kick off to busy spring/ summer events as the plans for the construction of a new Shikhar Bandhi Temple are underway. Please visit www.jsmw.org for more info. Tapovan NRI Shibir aims to impart Jain values and sanskar to our NRI kids.This is the sixth year of the shibir where they are receiving confirmation from kids across the globe like New York, Dubai, Bangkok, Antwerp, London, China, Hongkong and other places. Please encourage the kids around you to participate in Tapovan NRI Shibir 2018 - an Exclusive Event for NRI Kids. Shibir dates: July 15, 2018 to July 21, 2018. Age groups: Boys - 7 Years to 16 Years | Girls - 8 Years to 12 Years. Venue: Tapovan Sanskarpith Amiyapur, Nr. Tapovan Circle, Ahmedabad, Gujarat, India. Please register here and visit the brochure for more info. 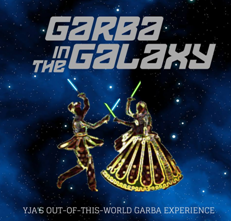 On the second night of YJA Convention 2018, get ready to dance ‘till your dandiyas drop with Garba and Raas night, Garba in the Galaxy! Bring your lightsabers because it’ll be out of this world! This’ll be one intergalactic gala you don’t want to miss! A 1: We get lots of thoughts for doing good or bad things and most of the time we act accordingly and accumulate good or bad karmas. The process of inflow of these karmas to the soul is known as Ashravas. A 2: The actual stoppage of the inflow of good or bad karmas to the soul is known as Samvar.